Planning a birthday party can be such a fun experience! There are a lot of little pieces that make up a successful birthday party. This free printable birthday party checklist can help you stay organized throughout the planning process. I’ll summarize all of the steps below. You can also print the free printable birthday party checklist so you can make notes while planning. What type of theme does your child want for his or her birthday party? Need help deciding? Here are some popular theme choices along with fun ideas for invites, decor, activities, food and treat bags. Make a list of people you’d like to invite. It’s important to have your child help with this step as well so that you don’t miss anyone. When counting the number of guests, also consider which parents will be dropping their kids off at the party and which ones will be staying for the duration of the party. When will the party be held? Be sure to consider the date, the start time and the end time. If there are a few essential guests, you may want to check their availability before you finalize the party date & time. Where will you host the party? Here are some fun ideas for birthday party locations. When booking a location, you’ll need to consider any restrictions this location has such as how many people they can accommodate, are they available on the date & time you want to host the party, any restrictions on bringing in your own food or cake, any restrictions on decorations, etc. Book the party location and pay any required deposits. Mail your invitations at least 1 month in advance. When the RSVP’s start coming in, be sure to ask parents if there are any dietary restrictions or allergies you should be aware of. Start thinking about what decorations you’ll include in the birthday party. On your printable birthday party checklist, make note of all the supplies you’ll need for the party. Which ones do you have and which ones do you need to purchase? When making your list of supplies, consider the following: How will I decorate the party? Do I need tape or string to hang anything? What will the food be served on? What plates and utensils will guests use? What about napkins? How will the guest tables be decorated? How will the cake table be decorated? Where will people sit? Do you need to order tables and chairs? What type of candle will you use in the cake? If any supplies need to be ordered, be sure you give yourself enough time for shipping. If some decorations have to be booked in advance (like helium balloons) but not picked up until the party date, order them and then make a note on your calendar of when to pick them up and who will be responsible for that. Start thinking about your party favors. Will you need to order any of your supplies in advance? Add any party favor items to your supplies list. What games will the guests play? You’ll want to start planning out the games and making a list of the required supplies. What will you give as prizes for the games? What food will you serve at the party? Does anything need to be ordered in advance? Make a list of the food you’d like to serve at the party. You could even start adding your groceries to your printable birthday party checklist supplies list. What will you serve for cake? Will you be making your own or ordering it? If ordering it, do you need to drop off any special supplies to the bakery ahead of time? When will the cake be ready to pick up? Mark this on your calendar along with the name of who will be responsible for doing this. Book your cake to confirm your order. On your printable birthday party checklist supplies list, be sure to also include items like a camera and batteries. Go through your printable birthday party checklist supplies list and purchase any items that are still outstanding. If hosting the party at your home, you’ll want to start doing the cleaning now. Look at your printable birthday party checklist supplies list and make sure you’ve purchased everything on the list. Did you include your groceries as well? If so, you’ll want to start stocking your fridge. Tidy up any areas requiring extra cleaning. Think about where guests will leave their coats and shoes. Make as much food in advance as you can. If anyone is assigned to pick up items for the party, call them for a reminder. Start your decorating. Set up an area designated for gifts. Set out a small table (by the front door) for the party favors. Start setting up activities for the party. Set out an area designated for trash and recycling. 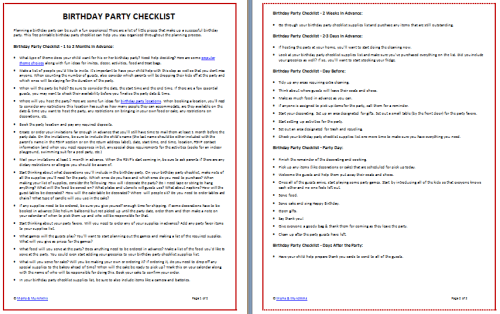 Check your printable birthday party checklist supplies list one more time to make sure you have everything you need. Finish the remainder of the decorating and cooking. Pick up any items (like decorations or cake) that are scheduled for pick up today. Welcome the guests and help them put away their coats and shoes. Once all of the guests arrive, start playing some party games. Start by introducing all of the kids so that everyone knows each other and no one feels left out. Serve cake and sing Happy Birthday. Give everyone a goody bag & thank them for coming as they leave the party. Clean up after the party guests have left. Have your child help prepare thank you cards to send to all of the guests. Happy planning and remember to have fun! We’re always adding new ideas for parties, freebies and more. Never miss an update by following along on Facebook, Twitter, Pinterest and Bloglovin’. I always wondered what is proper time to send out Invites! Thanks for thi. Oh my goodness if I followed this I’d be super organized! Great post! I need more organizations…I always get stumped on loot bags myself. With twins on the way I’ll need all the organization tips I can get! Great post. Great post! I only wish I was that organized! I’m the last minute type of girl lol! Love the suggestion of getting the kids involved in the thank you cards. Parents should be making sure the kids understand how important it is to say thank you! I’m glad you included the appropriate time to mail invites, I always worry I am too early or too late!